Today I spoke to the incredibly friendly and thoughtful Almas Jiwani (President of the UN Development Fund for Women in Canada (UNIFEM)) about the potential for the MAMA Project to make a difference in the world. Ms. Jiwani said she feels passionate about the importance of mothers in the world, specifically the power that we yield as nurturers of each new generation, and she has given many speeches to that effect. She told me she is proud of me for the work I am doing, and frankly I was overjoyed to receive such validation from somebody I look up to. Indeed, as conscious mothers we can create any change in the world, and it is also so important that we support each other in our endeavours. In my opinion, the ultimate experience of art is that of the viewers, so it follows that the ultimate photos are those taken by the public, as opposed to people really involved with the work. This is the unfiltered public view of the work. Especially with a moving, interactive project like this one, where the public is a vital part of the installation, each participant will see and record it in a different way. I rejoice in witnessing the many ways people have joined and experienced the installation. A few people who saw the Victoria and Colwood installations have sent me photos, and some others promised on the day of to send me their flickr pages. 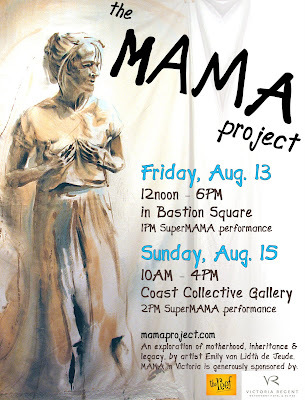 So I have created a flickr group specifically for photos of the MAMA project, taken by the public. If you have photos you'd like to include, please either email them to me, or put them up on flickr and ask me for an invitation to the group. I did a few pieces from the SuperMAMA performance (solo) in the space created by the sheets at both Bastion Square and the Coast Collective. This is "SAHM: Stay At Home Mom", one of the pieces I did at the Coast Collective, and was filmed by Markus. This is Markus -- my husband, and, of course, the reason this project is possible.Yes, he actually took vacation days to come help me set up the installation. Thanks are not enough for the gift he gives to me. Within the next couple of days, I'll get some photos up here from the installations. Small bit of news: I have decided that I'm willing to sell the sheets. Each sheet will be priced at $2800.00, and will come with a painted quote from the interviews. This money will enable me to continue touring the installation. It always seems to have such a deep impact on the people who see it, that I feel it's very important to keep it going. And this winter I will begin interviewing again, for more portraits/recordings.